Sebastian Gorka, the deputy assistant to Donald Trump who portrays himself as a counterterrorism expert, despite the fact that most of the counterterrorism Establishment disagrees with this self-assessment, is having an extremely rough week. On a Wednesday morning Fox & Friends appearance, he presented false statistics about the recidivism rates of Guantánamo Bay prisoners released by the Obama administration — numbers that ran contrary to the government’s own figures. That earned him a lengthy rebuke from factcheck.org and criticism from outlets like this one, as well as yet more opprobrium from a national security Establishment increasingly furious by his policy-making influence. It was downhill from there. 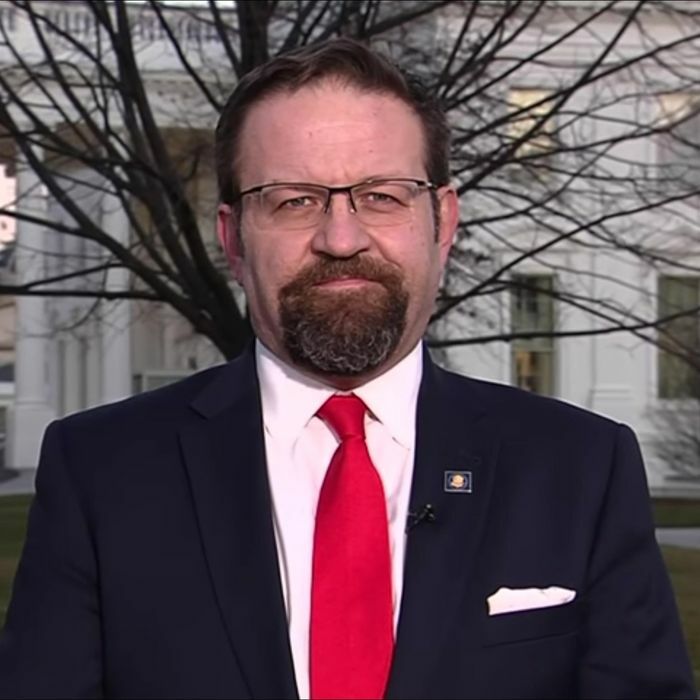 Just hours after offering the bogus stat, Gorka used his personal cell phone to call Michael S. Smith II, a Republican counterterrorism expert who currently resides in South Carolina and who has been extremely critical of Gorka on Twitter. That was, in fact, the subject of the call: The deputy assistant to the president was calling to complain that a private American citizen was being mean on Twitter. Not only did Gorka express his personal displeasure , Smith heard a threat in the call. “Gorka asserted my tweets about him merited examination by the White House legal counsel,” Smith told Newsweek. “In effect, he was threatening to entangle me in a legal battle for voicing my concerns on Twitter that he does not possess expertise sufficient to assist the president of the United States with formulating and guiding national security policies.” Shortly after Gorka made that alleged threat, Smith began recording the call, and the audio clip, published by Newsweek yesterday, is frankly mind-blowing. Most of the call consists of Gorka and Smith arguing and Gorka insisting they set up a meeting at the White House (presumably so Gorka can convince Smith he’s a credible expert). Over and over, Gorka yells at Smith about how out of line his tweets are — if you didn’t know the context, you would think the debate was over some absolutely vital life-and-death policy matter rather than, well, tweets. Gorka: Why is there such vitriol popping out of you constantly, every day now, it’s so strange. I look at your Twitter feed once or twice a day, and again, it’s half a dozen tweets about me, and I’ve never met you. Gorka, whose job is to keep Americans safe from a dizzying, ever-shifting galaxy of security threats and to guide the president’s counterterrorism policy, seems to be acknowledging that he spends a chunk of his workday monitoring the feeds of his Twitter critics. This is … unusual. Smith: I would submit to you that a majority of terrorism experts who have experience working with policy makers — which you do not, until now — would agree that you are not an expert of a level sufficient to be working in the White House with the president’s inner circle. Gorka: But that’s one man’s opinion — a man who has a two-year-old TV clip in his Twitter feed, and having to point out that he has an op-ed piece in The Wall Street Journal as your [Twitter] header. I mean, that’s your qualifications? You don’t have a TV hit from more [sic] than two years ago? I mean, isn’t that peculiar that you’re questioning my credentials and your last TV hit was two years ago? Smith: You have approached this conversation is a most childish and obnoxious manner. Gorka: Read your Twitter feeds. Read your Twitter feeds. Obnoxious? [super angry] Read. Your. Twitter feeds, okay? And don’t lecture me about obnoxious. Smith: I stand by everything on my Twitter feeds and there’s no way for you to change my opinion about that. To be completely frank about this, I find it most curious that a person of your manner, your demeanor, what you are exuding on this phone call, is deemed stable enough to hold a [security] clearance and work in the White House. Again, it’s simply striking how upset Gorka is over tweets. This isn’t normal behavior for a top-level wonk. Under normal circumstances, either the recorded call or the Forward story would be enough to jeopardize the position of a top-tier White House adviser. Then again, under normal circumstances someone like Gorka would only have access to the White House if he signed up for a tour.